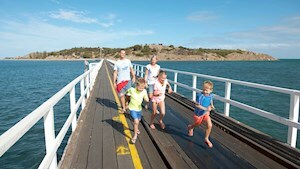 A caravan park, bowling green, public reserve and restaurant each claim the best position around Horseshoe Bay. A big future was envisioned for Port Elliot when it was earmarked in 1854 as the major Encounter Bay outlet through which the rich agricultural bounty shipped down the Murray River would be exported. A battered breakwater is all that remains of the failed attempt to construct a safe shipping harbour but in its place is one of the sweetest beach settings in South Australia. A caravan park, bowling green, public reserve and restaurant each claim the best position around Horseshoe Bay, which is protected by several little islands not far off shore where whale sightings are a regular attraction in winter. The town itself is a model seaside village, renowned for its cafés, pubs and gift shops along The Strand, its wide choice of accommodation, and a bakery regularly draw queues. Head for the train station to catch the Cockle Train to Goolwa or Victor Harbor, follow the Port Elliot Maritime Heritage Trail on the foreshore of Horseshoe Bay or explore vantage points such as Freemans Nob and the cliff top walking path for stunning views of the Encounter Bay coastline. Port Elliot was transformed into 'old Goolwa' for the filming of the new Storm Boy movie in 2018. Many of the historic local buildings were ideal for the film, set in 1960's Goolwa. See what people are posting about Port Elliot.